Sunday evening April 28, 2013, a group of extremist Israeli settlers burnt a land that belongs to the Greek Orthodox Church in Wadi Hilweh, in Silwan town, in occupied East Jerusalem. The Wadi Hilweh Information Center reported that dozens of extremist Israeli settlers and soldiers gathered in the area, and that the armed settlers went on to burn the church land. On Saturday, three Palestinians, member of the Al-Maghribi family, in Sheikh Jarrah, were injured after the settlers burnt the family’s land near their home, and the fire reached their residence. 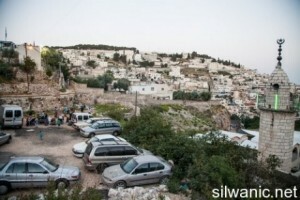 The settlers’ attack also targeted gardens that belong the Al-Maghrebi, Ja’ouni and Al-Khatib families, in Silwan. Furthermore, a group of extremist settlers burnt a Palestinian car, a home and trees in Sheikh Jarrah neighborhood in the city, several injuries have been reported. Also on Saturday, settlers torched nine vehicles that belong to the UN in Jabal Al-Mokabbir, in Jerusalem, the Maan News Agency reported.